The Halifax constituency will be no more if major changes to redraw the Parliamentary constituency boundaries in Yorkshire are given the go-ahead. The Boundary Commission for England has today released revised maps after it revealed in September last year that the number of MPs across Yorkshire would be reduced from 54 to 50. While that figure stays the same, 31 constituencies have been revised from the previous proposals. Nineteen have not been revised, however, and eight constituencies would be the same as they are under the existing arrangements. Changes have been made to the initial proposals for Calderdale where the constituencies will now be called the 'Lower Calder' and 'Upper Calder' constituencies. The Lower Calder will consist of Queensbury, Brighouse, Elland, Greetland and Stainland, Hipperholme and Lightcliffe, Northowram and Shelf, Rastrick, Ryburm and Sowerby Bridge. The Upper Calder constituency will stretch from Illingworth and Mixenden to Todmorden. The other wards of Calder, Luddendenfoot, Ovenden, Park, Skircoat, Todmorden, Town and Warley will also make up the constituency. Sam Hartley, Secretary to the Boundary Commission for England, said: “We’re delighted with the huge number of comments on our initial proposals that we’ve received from members of the public, many of which contain valuable evidence about people’s local communities. "Based on what people have said to us, we have revised more than half of our initial proposals. "The new map of the country we publish today is, we think, close to the best set of Parliamentary constituencies we can achieve, based on the rules to which we work and the evidence given to us by local citizens. Elsewhere, Jeremy Corbyn’s constituency remains under threat as the Labour leader’s Islington North seat would cease to exist under the proposals. The review of boundaries is aimed at reducing the number of MPs to 600, representing broadly similar-sized electorates. 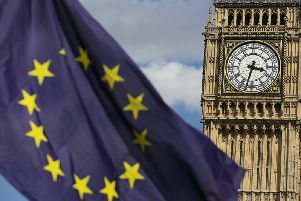 But the proposals appear unlikely to be approved by Parliament after Theresa May lost the Conservative majority in the Commons as the plans would face stiff opposition from other major parties and disgruntled Tories who stand to lose their seats. The Democratic Unionist Party, whose 10 MPs Mrs May relies on to have a majority in the Commons, are also seen as unlikely to support moves which could see their representation cut. Final proposals will be submitted to Parliament in September 2018 and if agreed, the new constituencies would be in use at the next scheduled general election in 2022.